The latest issue of The Irish Review Vol. 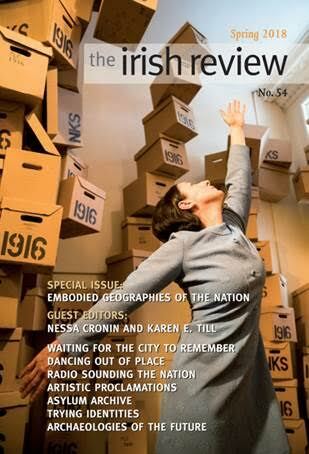 54, ‘Embodied Geographies of the Nation’ edited by Dr Nessa Cronin (Centre for Irish Studies, NUI Galway) and Professor Karen E. Till (Geography, Maynooth University), is now available;https://theirishreview.com/2018/06/14/the-irish-review-54/. Discursive panel sessions have been dedicated to the publication of this Special Issue at the Conference of Irish Geographers (Maynooth University, 2018), and we are also delighted to have Professor David Lloyd and Dr Maureen O’Connor as Guest Discussants to the next series of panel sessions on this issue at the American Conference of Irish Studies in UCC in June 2018. How do artistic practices and knowledges enhance scholarly interrogations of Irish pasts and presents, and contribute to more publicly-minded ways to remember possible futures? The issue builds upon recent international work calling attention to the significance of place-based and embodied creative practices that imagine and perform alternative national bodies. Coming at the midpoint of the Irish ‘Decade of the Centenaries, 2012-2022’ (and following the 2016 commemorations in particular), the essays inquire how artistic and scholarly research might contribute to rethinking the nation across varied Irish geographical settings, north and south of the border, and beyond. Contributions from Irish Studies scholars, artists and cultural geographers include, Tim Collins on ‘sounding the nation’ and Raidió Éireann, Gerry Kearns on the languages of the Irish Proclamation, archiving the Irish asylum experience by Vukasin Nedeljkovic, the 2016 Féile Fáilte of Roger Casement by Fearghus Ó Conchúir, ANU’s work on mapping forgotten histories of 1916 by Karen E. Till, the intertwined lives of Casement and Erskine Childers by Bryonie Reid, and Gerard Donovan’s archaeologies of the future by Nessa Cronin.